Posted on Friday, October 26th, 2018 at 9:00 am. Love the idea of cycle touring around New Zealand but have no idea where to go? Or, maybe you’re daunted by the thought of big hills and long slogs – you’d like something laid-back and easy to get you into the groove? Allow us to introduce the Nelson Great Taste Trail Tour – a 6 day meander through the beautiful surroundings of the upper South Island. With large portions of the route following quiet backcountry roads and flat coastal trails, this is a perfect tour for a less experienced rider. And it’s likely the weather gods will shine down upon you as well – this is one of the sunniest regions in New Zealand. The tour will take you past vineyards, farms, countryside and beaches, with ample stops along the way to sample local wines, brews and cuisine. Discover the city of Nelson – known for its sunshine, arts, wine and great food. 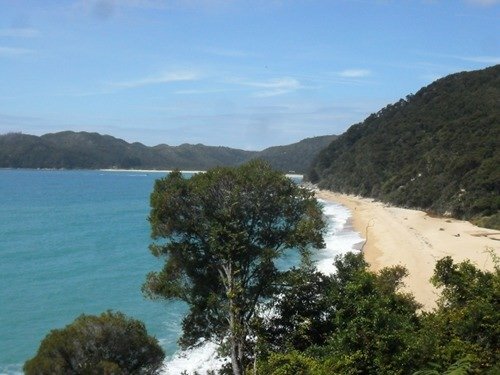 Enjoy a half-day walk on the famous Abel Tasman track. Sail through the Abel Tasman National Park on a catamaran. Be wowed by the picturesque scenery of the Nelson Lakes National Park. Tour guide, support vehicle and luggage transfer are all included. Pick from three guaranteed departure dates for summer 2018/19: 11 November 2018, 20 January 2019 and 17 February 2019. Other tour dates are also on offer – head here for a full list, or get in touch if you have any questions. P.S. Want to make the riding even easier? E-bike hire may be available for this tour. Get in touch for more details. Image: Abel Tasman National Park.